Shrink rings are a professional finishing touch to your home crafted speargun bands. They are used to cover the constrictor cord after tying and can be shrunk to a tight fit with a heat gun. Our new shrink rings feature a lower 212°F(100°C) activation temperature. 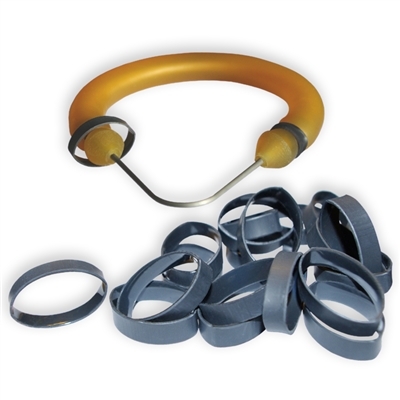 These large size rings are recommended for band tubing between 5/8 inch(16mm) and 3/4 inch(19mm) diameter. Storage Temperature: This low temperature shrink tubing will be activated at temperatures as low as 100°F(38°C) if exposed for a period of time and should be stored at a lower temperature.